Newborn babies may suffer from irregular patterns of breathing and sleeping at night. The article discusses causes of nighttime grunting and dealing ways. Newborn infants often suffer from irregular breathing and sleep patterns that may cause distress in their parents. In majority of the cases, grunting and other types of noises are usually harmless. However, in some cases, they may indicate a serious medical condition. Hence, it’s imperative to be aware of the signs and causes so that you can reach your baby’s pediatrician in time. What Causes Newborn Grunting at Night? Your newborn baby may be having bowel movements during sleep. The noise and grunting could be due to that; hence, you should check their diaper. Newborns grunt while passing stools as the muscles of their tummy are not developed fully so they require more effort in pushing the stool out. Also make sure whether your baby is suffering from constipation, as in that case, they may need help. The face of your baby will turn purple or red while passing stool. They will cry, strain or grunt during the process. Will get irritated a couple of minutes before passing stool. Their stool is very hard and dry. They will not pass stools regularly. They will not like to feed in the usual way. Your newborn baby may grunt as they may be having dreams. Even newborn babies dream too and this may cause newborn grunting at night. If your newborn is making a grunting sound at the end of each breath, they may be having difficulty in breathing or taking in air. You should call the physician for possible medical conditions such as sepsis, heart failure, meningitis or respiratory distress. Observe your baby carefully. If your infant is showing the following signs, it could indicate a problem of the respiratory tract and requires immediate medical help. Allow natural pressure that may help milk to go down in the stomach effectively. Feed slowly so that the stomach can empty itself simultaneously. Use certain medicines to lessen the stomach secretions. Everything in a newborn baby is narrow and small. Even the nasal passages in a newborn are narrow during the initial few weeks. Due to this mucus is trapped in the passages creating a sound effect, which is heard as newborn grunting at night. Neonatal respiratory distress syndrome is a fatal illness, which occurs when an infant’s lungs are not matured completely. Though it is common in babies born prematurely, still it can occur in full term babies as well. Signs of this syndrome include blue colored skin, reduced urinary output, pauses in between breathing (brief), nasal flaring, unusual movements while breathing such as drawing in muscles of chest and grunting. If you observe signs of this syndrome or your baby does not breathe for greater than 10 seconds, immediately make a call to 911. Massage: You can massage your newborn gently before bedtime to soothe and calm them. Take a few drops of olive oil and mix with couple of drops of peppermint oil and massage your baby particularly on the abdomen. It will relieve their acid reflux and also help them sleep. Aromatherapy: It is good to have a humidifier or a diffuser at your home. It helps in the regulation of temperature and humidity. You can also put lavender oil (diluted) in the diffuser so that your newborn can have a more relaxing sleep and get relief from newborn grunting. Warm bath: You can give your newborn baby a bath in warm water before they sleep at night. It will make them feel comfortable, calm and fresh. Swaddle them, while putting them to bed. Rub eucalyptus oil or rub (Vicks vapor rub) to your infant’s feet (sole) and chest before putting socks and swaddling. 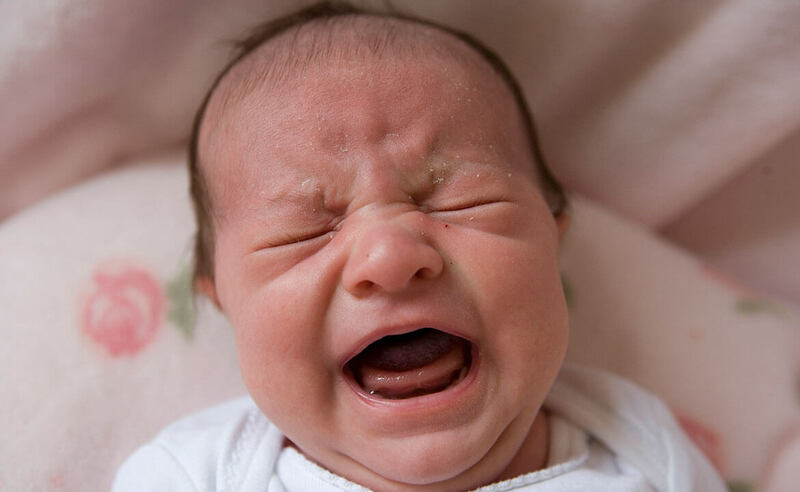 What Can You Do About Baby Grunting? When you notice any signs in your newborn, which may indicate some medical illness, immediately make a call to your pediatrician. If you are describing the observations on phone, describe them as accurately as you can so that your physician can make out whether the signs require an emergency treatment or are normal. Monitor your newborn while sleeping. If you sleep in a different room, put a baby monitor in your baby’s room so that you can monitor their grunting and distressing movements at night. Maintain a journal. Your baby may not make grunting noises on the very first day. You should write all your observations in a journal starting from the first day. This will help the pediatrician diagnose your baby’s condition in a better manner. Identify whether your baby grunts during the Non-REM state or it is a sign of a medical illness. Once your newborn is in Non-REM you should not pick them up or try to quite them. In this way you will awaken them from their sleep. Try changing your baby’s formula. If the cause of newborn grunting at night is constipation, you may try to change their milk formula. There are many milk formulas available in the market, which are digested easily. Try the formula that suits them. You should look for a hypoallergenic formula. A newborn baby suffering from reflux is intolerant to cow’s milk. Take extra care of your infant while sleeping. While your newborn baby is sleeping, use pillows to keep their head elevated at an angle of around 30 degrees. You may also make them sleep on their side so that acid is cleared from their esophagus. Breastfeeding. It is better if you breastfeed your baby instead of giving milk formula as mother’s milk is easily digesting and prevents constipation. You must take care of your diet so that acid reflux does not happen in your newborn baby.